All my life I’ve loved Halloween and when I was a kid, nothing … and I mean nothing was better than trick-or-treating. You never knew what you’d get in your bag/pumpkin, and I always relished trying the strange stuff first so that I could save my prized Bit-O-Honey’s and Milk Duds for later. I’ll never forget the night while trying to peer through the eye-holes in my skeleton mask, I fished out what appeared to be a red jawbreaker. Feeling adventurous, I popped it in and commenced sucking. At first it was all cinnamon-y goodness, but then, suddenly, the bottom dropped out and there was a horrible, flesh-searing pain, as though someone were putting a cigarette out on my tongue. And yet … and yet … I kinda liked it. That was my first Atomic Fireball. 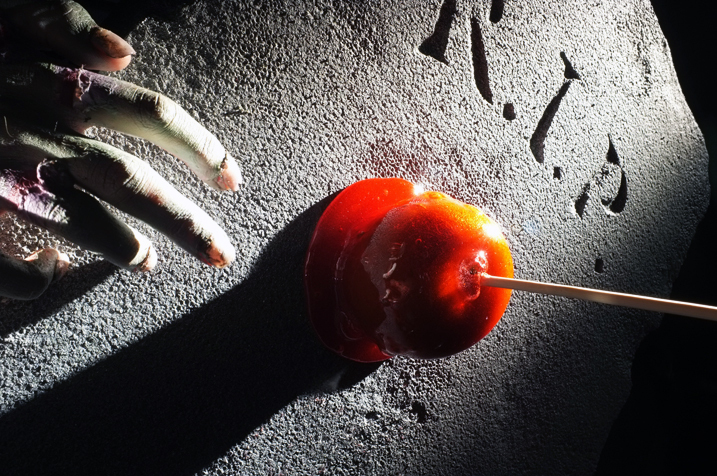 I’ve attempted to replicate that experience in what appear to be harmless candy apples. (Evil laughter). Cinnamon oil is available at many a megamart as well as the interwebs. Why those particular varieties of apples? I never thought of using cayenne but I’ve made some mean atomic hard candies following normal hard candy recipie but using 2-3 drams of cinnamon oil instead of the small amount they call for. Wash hands after using cinnamon oil. It can burn if you touch the wrong places. But aside from that I just made some, and they’re amazing. What if you substituted some of the water with fireball whiskey? it’d be a waste of Fireball. The cinnamon oil has more than enough of a cinnamon kick to it, and since you’re cooking the mixture to 300 degrees F, any alcohol soluble flavors that it would have imparted will long be obliterated.